On each side of the Transit Tunnel, the "T" light rail line follows the original streetcar right-of-way. Traveling outbound the line runs down the center of Broadway through Pittsburgh's Beechview neighborhood and into Dormont. Crossing Hillsdale Av in Dormont, the line begins its own right-of-way, cutting diagonally through several residential blocks of Dormont to parallel Raleigh Av. The intersection of Raleigh Av, McFarland Rd and West Liberty Av (which becomes Washington Rd as it crosses from Dormont into Mount Lebanon) has long been a meeting point for several trolley lines: Dormont Junction. In the streetcar days, the line turned to run down the center of Washington Rd for about eight blocks. Between Alfred St and Central Square, the trolley line turned left to leave Washington Rd and enter a private right-of-way. The line descended a short hill to Shady Dr and continued southward along Pennsylvania Blvd toward Castle Shannon and Washington Junction. This was one of several local and interurban lines consolidated as the Pittsburgh Railways Company with end-of-the-line destinations which included Charleroi and Washington, PA. While the later Port Authority busway projects relied on difficult and costly property acquisitions and sharing space with railroads, many of the trolley lines in the South Hills ran on private right-of-ways cut along wooded hillsides and away from existing roadways. This may have simplified the transition from trolleys to light rail vehicles (LRVs); only a relatively short section in Beechview and the Allentown line over top of Mount Washington run on city streets. The elimination of street running sections included the Mount Lebanon Transit Tunnel which bypasses eight blocks of Washington Rd. Southbound LRVs enter the tunnel at McFarland Rd and Raleigh Av near the Dormont Junction station. After traveling through the tunnel to a depth of about 100 feet, the "T" emerges at the Mount Lebanon station between Shady Dr and Parse Wy. South of this station the line merges with the original trolley right-of-way near Alfred St.
Groundbreaking was held in December 1980 for the Port Authority's Stage I Light Rail Transit program which began the conversion of the former South Hills trolley lines. In October 1981, construction began on the downtown subway portion. In July 1985, the subway and the line from Washington Junction to South Hills Village were the first sections of the "T" to open. By 1987 the final section of Stage I was opened through Beechview. At that time, two-car trains were introduced. Until 1999, the new vehicles from Adtranz/Duewag shared the line with a few survivors from the PCC trolley fleet which once numbered over 600 vehicles. Adtranz was the successor to Westinghouse which had designed the ill-fated Skybus system. Acquired by Bombardier Transportation in 2001, Adtranz also designed the rubber-tired people mover system for the Pittsburgh International Airport. Two routes use the Mount Lebanon Tunnel. 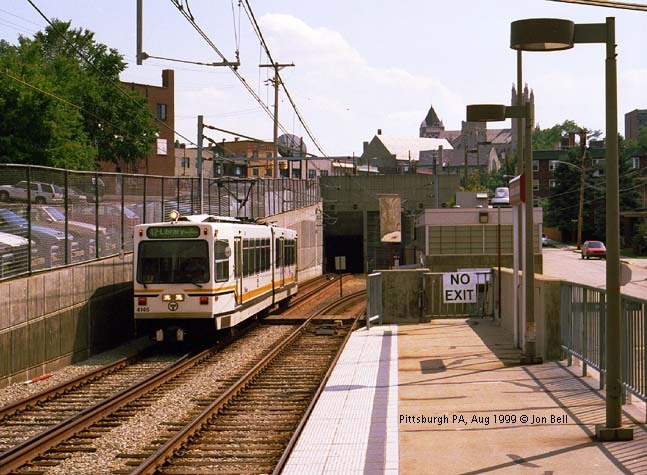 The 42L connects Pittsburgh's downtown subway to Library via Beechview. South of Castle Shannon, this once once part of the interurban line to Charleroi. The 42S also runs from the downtown subway through Beechview, then diverges at Washington Junction to follow another former interurban line, in part, to South Hills Village.